Nick Ryan (DC’11) is forging his own path—by pogo stick. 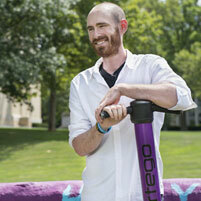 In 2010, while Ryan was still a student at Carnegie Mellon University, he co-founded Xpogo—an events, media and retail company dedicated to growing the sport of extreme pogo. Ryan’s passion for pogo has been more than a decade in the making. “Around 2001, I got a pogo stick for Christmas and just never put it down. I created tricks in my backyard, built a website to share them all and connected with a few other guys across the country who were doing the same,” he said. Today, as Xpogo’s CEO, he works tirelessly to transform the perception of pogo from a toy to a sports lifestyle. One way he’s doing that is with 200 events each year, including the annual Pogopalooza celebration. The event, which humbly began in a Nebraska parking lot 12 years ago, has grown into the world pogo stick championship competition. This summer, Pogopalooza came to Pittsburgh’s Carrie Furnaces; a group of Xpogo athletes also made an appearance at the Three Rivers Regatta. “In a nutshell, Carrie Furnaces was awesome—not huge, but totally independent, and a great step forward for the sport,” Ryan said. After being sidelined by injuries, Ryan shifted his focus to getting an education and re-engaging with the sport from the business side. He credits CMU with pushing him to chart his own course through a culture where uncertainty and exploration were accepted—even encouraged. When he came to CMU, Ryan—a self-described “liberal arts person”—was excited by the diverse course offerings of the Dietrich College of Humanities and Social Sciences. “It’s a place for people who have varied interests to have a home,” said Ryan, who majored in professional writing and ethics, history and public policy. Ryan thrived in an environment where innovation and creativity were the norm. As an active member of the Scotch ‘n’ Soda Theatre, he found a social outlet and also learned valuable business skills. “It gave me the courage to take the leap into entrepreneurship,” he said. His professors—including Jay D. Aronson—held Ryan to high standards and readily offered help and encouragement. “When I think of Nick, the thing that sticks out more than anything was the passion he showed for everything he was involved with – whether it was his coursework, his extracurricular activities or his love of extreme pogoing, a sport that I quite frankly didn't even know existed before I met him,” said Aronson, associate professor of science, technology and society in the Department of History. “When he told me that he was going to focus on building the sport after graduation, I have to admit that I was more than a little skeptical, but I admired his willingness to strike out into the unknown rather than taking a ‘safe’ job,” he said. Ryan is no stranger to taking risks. In 2017, he plans to take another leap when he moves the company’s headquarters from a high-rise in Manhattan to Pittsburgh. According to Catherine Copetas, assistant dean for industrial relations and director of special events in the Computer Science Department, Ryan’s positive attitude and business savvy are driving forces behind the success of Xpogo and Pogopalooza. Copetas met Ryan through Ben Brown, a project scientist who co-invented the BowGo robotic pogo stick at CMU. She was instrumental in helping Ryan get Pogopalooza off the ground. Watch Ryan talk all about Xpogo and show off some moves.